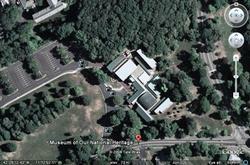 As you can see from this Google Earth image showing our Museum in Lexington, MA, we are surrounded by quite a bit of green and open space. This is partly because our sponsoring organization, who purchased 22 acres of land in 1968, wanted room enough for a headquarters for the Scottish Rite Northern Masonic Jurisdiction (NMJ) and a Museum and Library, and the fact that the Town of Lexington has had a longstanding commitment to conservation. It was determined early on that the existing home and carriage house on the property could be used for administrative offices so the NMJ went about planning for a national museum on the campus. The Town worked with the architects to scale the design and roof lines in keeping with the existing residential neighborhood. The result was an A.I.A. award-winning building -- and the retention of lots of trees and open space. One of the wonderful aspects about our campus, and something not many places can claim, is that if you look at maps of our corner of the world for the past 230 years or so, you can see a lot of the original openness remains. We are located at the corner of Massachusetts Avenue and Marrett Road. In 1775, when General Gage's Regulars passed on what is now Massachusetts Avenue (the road to the far right on the Google map above), it was known as the County Road or, to old timers as the Great Road (to Cambridge or to Concord depending which way you were traveling). Marrett Road was the Road to Bridge Farm. In this close-up recreation of Lexington in 1775 produced for the April 19th Bicentennial in 1975, you can see no buildings stand on what is now our corner property. There were several houses and farms in the general vicinity and one of the closest was the Munroe Tavern, which remains today about a half a mile from us up Massachusetts Avenue. A hundred and one years later Lexington was more settled. 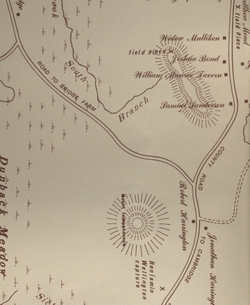 The portion of an 1876 map below shows buildings belonging to both 'Nunn' and 'Tower' on our current property. According to Lexington historian Charles Hudson, "William Augustus Tower (1824-1904) was born in Petersham the eldest of 11 children. In 1850 he moved to Boston and entered the flour and grain business in Haymarket Square, as a member of the firm of Rice, Tower & Co." He first bought property in Lexington in 1855, and went on to become a successful merchant and banker. Thomas Sileo, in Historic Guide to Open Space in Lexington provides more details: Tower purchased a house and land in Lexington from Jacob J. Nichols, on the hill, and in 1873 he had a Victorian mansion built. By 1886 the Tower estate included a barn and stable, 2 cottages, a tea house with a flower garden and greenhouse, a windmill, 8 horses, 2 cows, and 8 carriages. Initially the Tower’s family spent summers in Lexington and winters on Commonwealth Avenue in Boston but later he lived in Lexington year around. By 1904 when he died, Tower owned 127 acres. In 1906, Tower’s son Richard, also a banker, erected a red brick house on the knoll off Marrett Road. It is Richard Tower's renovated home that is now the Scottish Rite's NMJ headquarters. William Tower’s original Victorian House which was closer to Pelham Road, no longer exists. Tower's daughter, Ellen, continued to live in Lexington and it was she who donated Tower Park (across Mass. Avenue from the Museum) to the Town in 1928 in honor of her father. Though accounts of Tower and how active he was in Lexington differ in various histories about Lexington, notably he was Chief Marshall at the Lexington Centennial on April 19, 1875. The Chas. Nunn (1828-1882) house (noted on map at left) is closer to where our Museum sits today. Edwin B. Worthen, in Tracing the Past in Lexington, Massachusetts, pays special attention to East Lexington, where he grew up. In the chapter, 'The East Village as I remember it', he reminisces: "Opposite our house on the upper corner of the present Marrett Road lived the Nunns in the big house now owned by Ralph Smith. Much earlier there had been a small house on the property which probably dated from the early 1800s. Mr. Nunn came to Lexington before the Civil War married Susan Pierce and built the present residence.... I do not remember Mr. Nunn as he died in 1882 but he had taken his part in town affairs." Town records for 1860 indicate Nunn had a much smaller estate than the adjoining Tower's. He owned 1 house, 1 barn, 1.5 acres of land and paid $47.80 for real estate tax that year. The Nunn house no longer exists today as it was destroyed by fire on November 10, 1972. The horses and windmill are gone, and admittedly the footprint of both the Museum and the headquarters of the Scottish Rite NMJ are larger than the original Nunn and Tower properties, and, of course, we've added a parking lot to accommodate visitors. However, if you take another look at the Google Earth image above or come to visit us in person, it's definitely possible to imagine what this area looked like in the past. Many useful resources exist that make any research about Lexington's past easy to find. Our Library has extensive resources about Lexington, its early residents and Revolutionary War history. Our Archives hold materials related to the development of the property (including blueprints and correspondence). Please contact the Library & Archives for more information and assistance. Hudson, Charles. 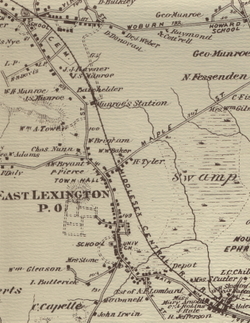 History of the Town of Lexington. Boston: Houghton Mifflin Co., 1913. Sileo, Thomas P. Historical Guide to Open Space in Lexington. Lexington : Thomas P. Sileo, 1995. Worthen, Edwin B. Tracing the Past in Lexington, Massachusetts. New York: Vantage Press, 1998. Call number: F 74 .L67 W67 1998. This (and other Worthen books) contain many useful maps. Cary Memorial Library holds the entire Worthen Map collection which shows the progression of Lexington beginning in 1636 in a series of maps drawn by Mr. Worthen in 1924.